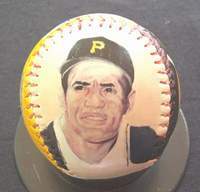 This Legends Hand Painted Roberto Clemente Baseball features my original paintings of Roberto. Side one features this Hall of Famer from his National League Most Valuable Player season in 1966. Clemente beat out the Dodgers' Sandy Koufax for the award that season despite Koufax winning 27 games. 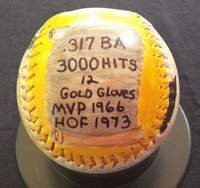 Roberto batted .317 with 202 hits, 29 home runs and 119 runs batted in during that 1966 season. Side two shows Clemente lining a double off the Mets' Jon Matlack for his 3000th hit at Three Rivers Stadium on September 29, 1972. It was Roberto's last regular season hit. 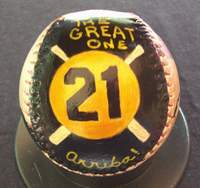 Side three is Roberto's famous number 21 which the Pittsburgh Pirates retired in 1973. Underneath number 21 is the word "Arriba!" which was a common cheer for Roberto. 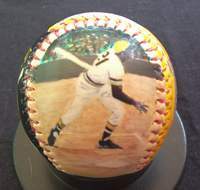 Side four is a hand painted scroll with some of Roberto Clemente's most important statistics, and the year he was inducted into Baseball's Hall Of Fame. 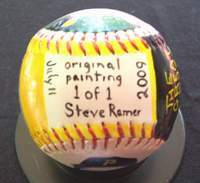 And side five is my signature and date this Legends Hand Painted baseball was completed. Also on side five you will see "1 of 1". This means that this is number one of only one in the series. There will not be another exactly like it.